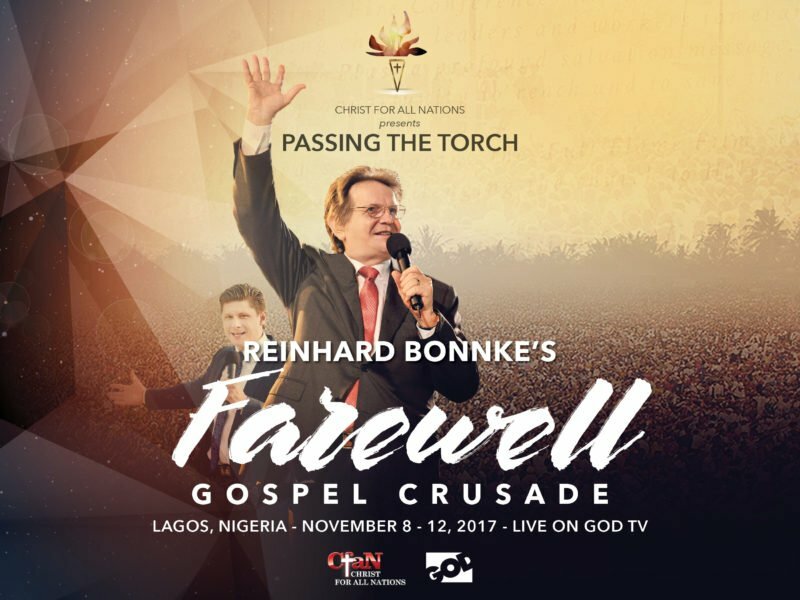 GOD TV broadcasts Reinhard Bonnke Farewell Crusade LIVE from Lagos, Nigeria. Evangelism is the lifeblood of the Church and every believer is challenged to make an eternal difference. This is why great evangelists like Billy Graham and Reinhard Bonnke are passionate about raising up others. Coming up in November GOD TV and CfaN bring you an opportunity to witness evangelism on a scale not seen before. Furthermore, you are invited to receive a powerful evangelistic impartation. After 40 plus years of ministry, Christ for all Nations (CfaN) is hosting Reinhard Bonnke’s Farewell Crusade in Nigeria. Millions of people are expected to attend and the choir alone is said to number over 20,000! At this historic event, Brother Reinhard will pass on the baton of his evangelistic calling and who better to receive this than you? Tune in to GOD TV from November 8-12 each evening and be prayed for to receive an evangelistic mantle from the dearly loved German evangelist. “I am going to pass that burning torch that the Holy Spirit gave to me to all who want to receive it and follow in my footsteps.” – Reinhard Bonnke. With over 76 million salvation decisions to date, Reinhard Bonnke must be one of the greatest evangelists of all time. What’s more, millions have received the Baptism of the Holy Spirit at CfaN’s Fire Conferences. God has used him in an unprecedented way to preach a simple Gospel message that everyone can understand. In addition, he has a passion and boldness that cannot be ignored. And, despite all Reinhard has accomplished in the past four decades he is one of the most humble people you could meet. I had the privilege of interviewing him once in Washington, DC and was impressed by how down to earth and friendly he was. I also remember attending his crusades in Harare and Johannesburg as a young man, having grown up in Africa where CfaN started. Back in the 1980s we were amazed at his enormous tent that seated over 34,000 people. Little did we know then that the millions were coming. The big tent was literally blown apart by a storm and the enemy thought he had won, but God had even bigger plans. Divine plans that could not be contained in any tent. No wonder, “From Cape to Cairo, Africa shall be saved” has always been Reinhard’s famous battle-cry for the African continent. Now as Reinhard bids farewell to Africa, CfaN is planning what may be the biggest gathering in the history of the Church. The CfaN team believe the evangelist’s return to Nigeria could attract attendance figures that exceed the millions who gathered in 2000. During the Lagos Millennium Gospel Campaign, 6 million people came and 3.4 million decisions for Christ were made. In November 2017, CfaN anticipates that even more people will attend and there will be many more decisions for Christ. For those attending the Farewell Crusade a ‘Passing The Burning Torch Conference’ will be held during the day. This is specifically for church leaders and thousands of pastors and evangelists are expected to gather in Lagos in person. Moreover, viewers like you will be watching from all over the globe on GOD TV as it broadcasts the evening sessions of the crusade LIVE. These will also be replayed in prime time for each of GOD TV’s five regions. During these evening sessions, Reinhard has promised to pray for viewers to experience some of his anointing in their lives and ministries. “I am going to pass that burning torch that the Holy Spirit gave to me in my early years to all who want to receive it and follow in my footsteps, in Nigeria and around the world.” he said. So, if you want to be used by God, then be sure to tune in and receive this burning torch. Reinhard has already handed over the leadership of CfaN to Daniel Kolenda. This took place some years ago and Daniel will continue to steer the ministry from strength to strength. Daniel will also speak at the Farewell Crusade which will definitely not be CfaN’s last. The mass crusades will continue in Nigeria and elsewhere. Already a Fire Conference in London will follow later in the month hosted by Daniel. Speakers will include Peter van den Berg who has walked alongside Reinhard for many years. Fire 2017 will also feature popular speakers on GOD TV like Todd White; Nathan Morris and Eric Gilmour. Participate in Reinhard Bonnke’s Farewell Crusade on GOD TV at around 9 pm each evening from November 8 to 12. You can be part of this historic event in three ways. Host a mini event as part of a home cell or fellowship group. Groups can register with GOD TV Africa and receive a free ebook of ‘Unlocking The Miraculous’ by Daniel Kolenda. “Thanks to the partnership of our viewers, GOD TV is able to broadcast this momentous event worldwide,” said GOD TV CEO, Ward Simpson. “What an amazing opportunity we have been given to take the Gospel of Jesus Christ to countless homes across the globe. We thank God for all Reinhard has accomplished and know his legacy will endure. See GOD TV’s Online Schedule for exact programming times for your region including details of the LIVE broadcasts.